Acinic cell carcinoma (AciCC) is a low-grade malignancy and represents 15–20% of primary salivary gland carcinoma and mostly (85–90%) involves parotid gland. These are slow-growing carcinomas, and surgical excision remains the mainstay of treatment. Postoperative radiotherapy is indicated in cases of recurrence or incomplete surgery. Although local recurrence is common, lymph nodal and distant metastases are rare events. In this report, we present a case of AciCC recurring after 10 years of initial treatment in cavernous sinus and multiple bony sites. A 62-year-old male patient presented to the ophthalmology clinic of our institute with occasional headache and diminution of vision which had been gradual and progressive over the last 1 year. He had taken nonallopathic medicines for 6 months before visiting our clinic. On examination, there was ophthalmoplegia, and pupils were sluggishly reactive to light bilaterally. There was palsy of third, fourth, and sixth cranial nerves on both sides and fifth cranial nerve on the right side. Visual acuity was 6/36 on the right side and 6/18 on the left side (Snellen equivalent in meters). Performance status as per Eastern Cooperative Oncology Group was one. Examination did not reveal any local or locoregional disease recurrence. He was previously diagnosed with AciCC of the right parotid gland in 2004. He underwent total parotidectomy followed by radiotherapy (60 Gy in 30 fractions over 6 weeks) to the local site then indication of radiotherapy being T4 disease and perineural invasion. He had developed seventh nerve palsy on the right side postsurgery for which right-sided partial tarsorrhaphy was done. He had been lost to follow-up and been asymptomatic until January 2014, when he presented with above symptoms. Magnetic resonance imaging of the head and orbit showed an expansile lobulated mass with heterogeneous signal intensity in bilateral cavernous sinus with encasement of the internal carotid artery on both sides. The mass was indenting the right optic nerve and chiasma; however, the left optic nerve was not involved [Figure 1]. 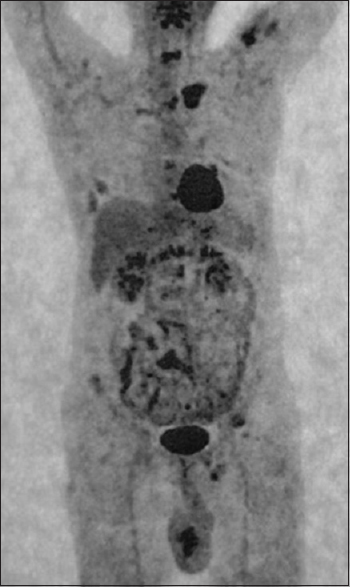 Fluorodeoxyglucose positron emission tomography/computed tomography showed multiple lytic lesions with increased uptake in the left clavicle, sternum, multiple cervico-dorso-lumbar vertebrae and ribs, and pelvis [Figure 2]. A transsphenoidal biopsy was planned, but in view of the multiple easily accessible lytic lesions in bones and soft tissue component associated with the left clavicular lesion, a biopsy from the clavicle was done which showed cells typical of AciCC and diffuse membranous immunopositivity for discovered on gastrointestinal tumor-1 (DOG 1) [Figure 3]. The case was discussed in multimodality head and neck cancer clinic. In view of the morbidity associated with the surgery and with useful vision present in both eyes, the patient was taken up for palliative radiotherapy to the mass in cavernous sinuses to a dose of thirty Gray in 10 fractions over 2 weeks. Twenty Gray in 5 fractions over 1 week was also given to the vertebral metastasis (fifth dorsal vertebrae) as it had a soft tissue intraspinal component and 8 Gy in single fraction to left pelvis. He completed the planned radiotherapy without interruptions and reported significant improvement in headache and back pain and mild improvement in vision. He further received six cycles of palliative chemotherapy with paclitaxel (175 mg/m2 intravenous day 1) and carboplatin (area under the curve 6, intravenous day 2) repeated every 3 weeks. At 12 months after completion of treatment, the patient has shown a partial response to the treatment and is under follow-up in our clinic. AciCC is a low-grade malignant tumor of the salivary glands; most commonly the parotids. These are the third most common malignancy of salivary glands in adults. About 35% of the cases have local recurrence during the course of the disease; however, lymph nodal and distant metastases are rare. Most common sites of metastasis in AciCC are lymph nodes and lungs. Skeletal and intracranial metastases are rare. There has been three previously reported case of AciCC of parotid with spinal metastasis.,, In the case reported by Vidyadhara et al., patient had a local recurrence and associated widespread metastasis to vertebra, sphenoid bone, and lungs. Metastases usually develop after long time interval from initial diagnosis. Smukalla et al. reported metastasis to sternum from AciCC of parotid gland after 12 years. Late recurrences have been reported in as long as 30 years after initial diagnosis. In our case, the metastasis was limited to the skeletal system and cavernous sinuses and occurred 10 years after initial treatment. It is noteworthy that in our case, the patient had no local recurrence. Cavernous sinus is a rare site for malignant tumors to metastasize. Occasional reports of plasmacytomas, lymphomas, and carcinomas of lung, breast, stomach, and head and neck have been noted. Dissemination to nervous system is rare. Thomason et al. reported AciCC of parotid with metastasis to pituitary gland. Parotid AciCC with cavernous sinus metastasis has been reported previously by Yildirim et al. ; the patient presented with similar clinical features suggestive of multiple cranial nerve involvement on the right side. Interestingly, the patient was alive at 18 months after detection of with evidence of disease. In our case, the patient had metastasis in bilateral cavernous sinuses. Bilateral cavernous sinus involvement could probably be explained due to the complex network of valveless veins between the two sinuses as in cavernous sinus thrombosis. It is important to note that unlike many other tumors, even after metastasis, acinic cell tumors can have relatively long survival and thus palliation of symptoms is very important. Although considered relatively radioresistant, patients have reported long-term clinical disease stabilization with radical radiotherapy and hence radiotherapy should also be considered for palliation of symptoms in AciCC., The role of chemotherapy is undefined in AciCC. Tsuda et al. reported complete response in a case of primary parotid carcinoma with isolated metastasis to cavernous sinus treated with radical radiotherapy followed by systemic chemotherapy with docetaxel. Thus, in patients with good performance status, systemic chemotherapy may be tried in metastatic setting. AciCC is a low-grade malignant tumor of salivary gland with some cases showing aggressive behavior. Skeletal and intracranial metastasis is rare and common conditions or other malignancies mimicking the same should be ruled out. Palliation of symptoms due to metastatic deposits should assume prime importance in cases of metastatic AciCC as the patients have a relatively long survival compared to other metastatic cancers. Grage TB, Lober PH, Arhelger SW. Acinic cell carcinoma of the parotid gland. A clinicopathologic review of eleven cases. Am J Surg 1961;102:765-8. Vidyadhara S, Shetty AP, Rajasekaran S. Widespread metastases from acinic cell carcinoma of parotid gland. Singapore Med J 2007;48:e13-5. Zook JD, Djurasovic M, Dimar JR 2nd, Carreon LY. Spinal metastasis from acinic cell carcinoma of the parotid gland: A case report. Spine J 2012;12:e7-10. Smukalla K, Kalinski T, Motsch C. Distant metastases on acinic cell carcinoma of the parotid gland after 12 years symptom-free interval. Laryngorhinootologie 2006;85:586-8. Thomason T, Oxford LE, Ducic Y. Metastatic acinic cell carcinoma presenting as a recurrent pituitary adenoma. J Otolaryngol 2007;36:E91-2. Yildirim N, Oksüzoglu B, Vural M, Han O, Zengin N. Case report: Cavernous sinus metastasis of the parotid carcinoma: A very unusual case. J Neurooncol 2005;73:181-3. Buiret G, Céruse P, Ramade A, Carrie C, Pommier P. Acinic cell carcinoma of the parotid gland with skull base invasion: Case study, managed by exclusive external 3D radiation therapy. Eur Ann Otorhinolaryngol Head Neck Dis 2012;129:111-4. Tsuda H, Ishikawa H, Asayama K, Saito T, Endo S, Mizutani T. Abducens nerve palsy and Horner syndrome due to metastatic tumor in the cavernous sinus. Intern Med 2005;44:644-6.